Diary of an Alpaca Farmer : What? Is my bin better than yours? Irony upon irony. At the risk of starting to sound like Victor Meldrew -can people please use their common sense and finish the job they started. I picked these two massive carrier bags up just left in the hedge on farm yesterday. They contain the remains of two or possible three disposable barbecues and all the detritus attached to a wee picnicin the countryside on a lovely summer day. 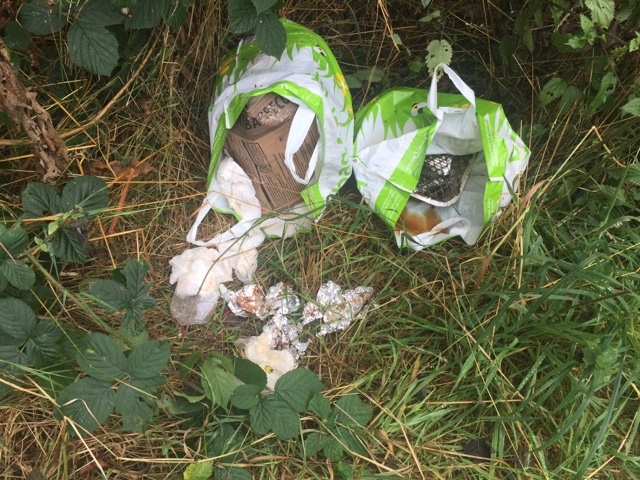 What I cannot understand is the logic of people who buy Eco- carrier bags from Asda- fill it full of their rucbbish and then dump it in the hedges and lanes of the wonderful clean countryside they came to enjoy in the first place. Who do you think is going to dispose of this lot for you? Firstly it will be the foxes, badgers, ratsand squirrels, not to mentioned seagulls, who will tear this lot apart in a night or two and scatter your debris all over the place. At which point your carefully packed rucbbish becomes not just an eyesore and an imposition but a tsunami of litter polluting the very space you came to enjoy. Get real people! My bin is not better than yours. You brought it out here please take it back! Or I warn you some young millennial is going to make themselves a fortune by creating an app that makes these Asda bags and the like traceable. Then we shall gladly send your detritus to be dealt with at your gaff, possible by drone!!! Enough! be logical and finish the job!